Motherhood was not something I thought would be for me. Before my husband and I got together, I thought I had missed the boat. And then, we had our son. I was not prepared, but like every other parent, we made it through those first months and then years. When I thought our little family would always be a family of three, along came our baby girl. We are perfect in an imperfect way. I'm not saying perfect, we are far from it. I make so many mistakes. I don't clean enough. I give them pizza for dinner too many times. But, we are perfect for us. And, I think we do a good job learning from mistakes. When I look back at these years I hope that my kids get the best of my husband and me. I also hope that I can teach them to be their best selves. More than anything I hope my kids don't become dumbasses. That is vague. I should be more specific. 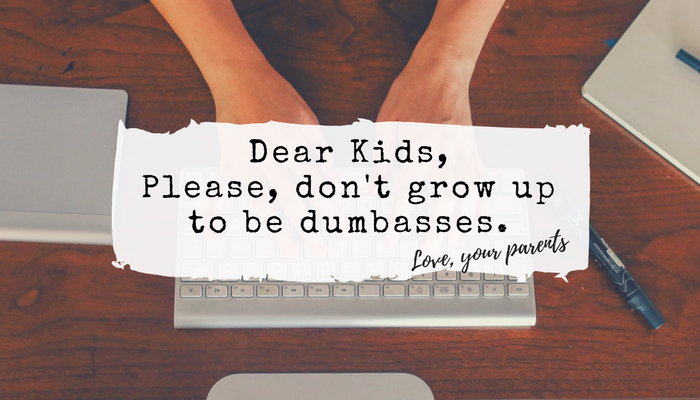 Please don't grow up to be dumbasses. I realize that if it happens it will be your dad and my fault. I'm writing this to help prevent it. I hope you learn from our mistakes. We make plenty, you should be able to learn a lot. Understand that you don't deserve anything you haven't worked for and earned. Your handicap does not define you. Please, don't use it as an excuse for any failures. Work harder and it won't matter. Make others see that you are more. Respect your elders. Respect authority. Especially if you don't think they deserve respect, treat them as they do. Treat others how you want to be treated. Not only now, but all throughout your life. You are not special. Yes, you are special to us, but you are not more or less than anyone else. We are so proud of the kindness you both have and share with others. Don't let anyone take that from you. There will be people who will say the meanest things without ever taking the opportunity to understand you. Forgive them. They don't even have to know that you do. Your story is series of amazing moments. And, even your worst days can make a great story later. Don't let it discourage you. When it does, come see us. We want to help. Be humble. Accept compliments. Smile at strangers. Be vulnerable. Finally, life isn't fair. But, it's all we got and you are loved very much. We love you. We support you. Please don't be a dumbass. How are you keeping your kids from becoming dumbasses?